Youth Adventures Awarded Grant - The Maurice Amado Foundation awarded CORBA a $2500 grant to go towards the Youth Adventures program for the purchase of bicycles, trailer upgrades and gear. CORBA graciously thanks the Maurice Amado Foundation for their generosity and recognition of the value of the Youth Adventures Program to Southern California youth. 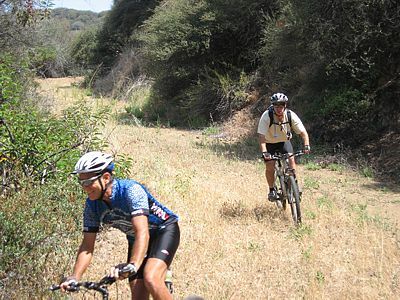 Skills Clinic - Saturday July 7 at 9:00am at Malibu Creek State Park. As an added bonus, Gary Fisher, Charlie Kelly, and Alan Bond, roommates in 1976 are anticipated to be there, as well as executives from, TREK, Gary Fisher Bikes, Shimano, and more on hand. Fat Tire Fest 2007 - The date has been set for the 2007 Fat Tire Fest and CORBA's 20th Birthday Celebration! Join us October 14 2007 for great riding, food, contests and our famous raffle. To volunteer or exhibit, please contact mtbike4@verizon.net. Look for updates in the coming months. Photo Contest - CORBA is looking for a new mountain bike image to use in promoting the 2007 Fat Tire Fest. For more information, please see the attached flyer.